Day of DH 2014! What does a day of pixelated humanism look like in my world? The highlight will be exploring issues with my graduate seminar on digital humanities (history of science 5970) in the afternoon. We’ll be talking open access, copyrights, open science, and more today. First thing to do in the morning will be reading the six students’ new blog posts (which can touch on anything related to DH), and thinking about what patterns their blog posts from across the semester may show as part of today’s class prep. Feel free to visit and join in the comments section! 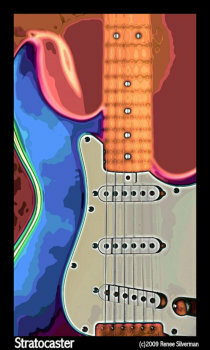 Image: “Stratocaster Pop Art” by Renee Silverman, via a creative commons Attribution-NoDerivs 2.0 Generic License. This entry was posted in Uncategorized on April 8, 2014 by Katherine Pandora.